ETA Richard Wolfe performing at the 2017 Flaming Star Festival. Photo by Lori-Anne Crewe. The young woman who works at Limeridge Mall in Hamilton, ON, who related her story to me about an ETA she knew, will be very happy to hear that her Delta High School alumnus, Richard Wolfe, has gone very far with his ETA career since the days she saw him perform in the school auditorium. She had heard that he went to Memphis to compete, but I don't think she knows what an achievement it was for a non-pro to earn a ticket to the Ultimate Elvis Tribute Artist Contest. In 2013, Richard tied for second place, but because he earned the most vocal points, he was on his way to the ultimate competition along with pro ETA Jesse Aaron, who already had his ticket from an earlier win. In a touching acceptance speech, Richard was overwhelmed with the unexpected win. I have had the good fortune to see Richard perform twice this year, once at Darren Evorglen's Legion concert and once in Toronto at the Flaming Star competition in October. Richard gave crowd-pleasing performances at each event. Richard came third in the pro category at Flaming Star, but in addition to the trophy he received, performing with Ultimate Champion ETA Gordon Hendricks during open mic, was Richard's most rewarding moment of the weekend. In an emotional speech, Richard explained to the audience what sharing the stage with his idol meant to him. It was a lot of fun watching the interaction between the seasoned professional and the young ETA as they performed a song from Gordon's Stripped Back album. We at SIDEBURNS Magazine wish Richard continued success. I wish to thank Richard's manager, Joyce Turner, for sending along the following bio to share with everyone. Additional photos of Richard are posted in Fan Info/Photos. Richard Wolfe hails from Hamilton, Ontario, Canada. He has been competing for over 10 years and has won many championship titles, including 2013 Lake George's Non Pro Champion, 2014 Collingwood's Movie Years Champion, King Trilogy Grand Champion, Flaming Star Festival 2015 Gospel Champion and Pro Division Grand Champion, and 3rd place at Flaming Star Festival 2017. The highlight of Richard's career was winning Collingwood's Non Pro Early Years in 2013 sending him to Memphis to compete for the Ultimate! You can find Richard Wolfe performing at festivals and shows throughout Canada and the United States. No matter where he performs, the energy Richard exhibits brings an audience to their feet and makes them twist and shout! 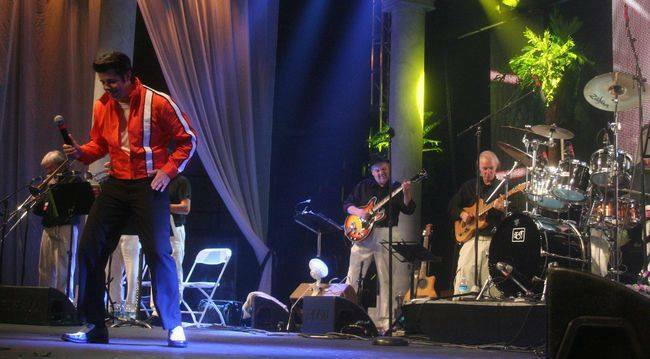 Richard performed Clambake, after he received a ticket to the Ultimate Elvis Tribute Contest in Memphis at the Collingwood Elvis Festival, Sunday, July 28, 2013. The Hamilton resident was honoured to represent Collingwood at the Ultimate Elvis competition in Memphis, TN. ETA Richard Wolfe performs Clambake at Collingwood, 2013. Photo by Morgan Ian Adams.